Iraq's military says it has completed an operation to retake disputed areas held by Kurdish forces since 2014. 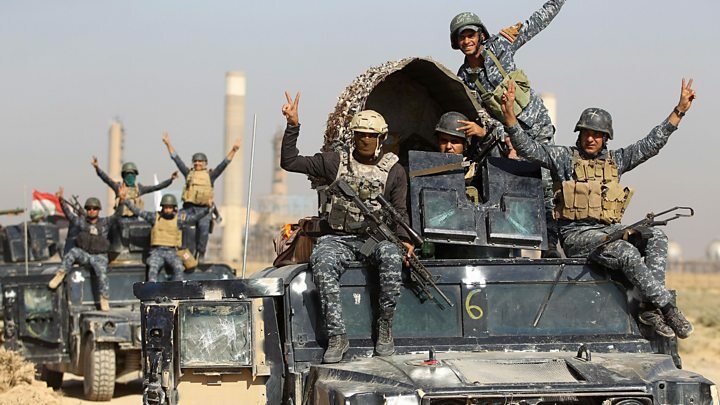 On Monday and Tuesday troops retook the multi-ethnic city of Kirkuk and its oilfields, as well as parts of Nineveh and Diyala provinces. Peshmerga fighters had seized the areas while battling so-called Islamic State. The military operation came three weeks after the Kurds held an independence referendum, which Iraq's prime minister said was now a "thing of the past". Mr Abadi called for dialogue with the Kurdistan Regional Government on Tuesday night, saying he wanted a "national partnership" based on Iraq's constitution. People living in the Kurdistan Region and the disputed areas overwhelmingly backed secession in the referendum, but Mr Abadi declared it illegal and rejected calls from Kurdish leaders for negotiations. A statement issued by the Iraqi military on Wednesday announced that security had been "restored" in previously Kurdish-held sectors of Kirkuk province, including Dibis, Multaqa, and the Khabbaz and Bai Hassan North and South oil fields. Peshmerga fighters moved into the areas after IS swept across northern and western Iraq in June 2014 and the army collapsed. A senior Iraqi military commander also told Reuters news agency: "As of today we reversed the clock back to 2014." The military's announcement came a day after Kurdistan Regional President Massoud Barzani vowed to keep working towards Kurdish independence, saying the referendum was not held "in vain". He did not call for dialogue with the government, but stressed: "Kurds have always been against waging wars and have worked in pursuit of peace." Mr Barzani also blamed the loss of Kirkuk on internal Kurdish disputes. The president's Kurdistan Democratic Party (KDP) has accused the rival Patriotic Union of Kurdistan (PUK) of ordering Peshmerga under its control to withdraw in the face of the Iraqi military advance. There was only one serious clash on the outskirts of Kirkuk on Monday, which is reported to have left between three and 11 combatants dead. A large statute of a Peshmerga fighter still looms over the entrance to Kirkuk, but otherwise there's little sign left of Kurdish control. 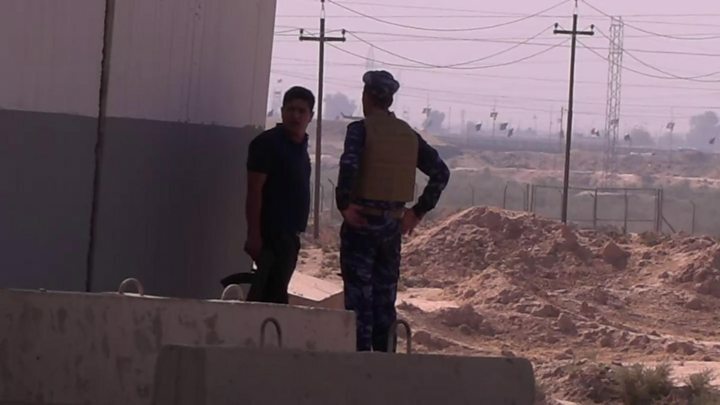 Iraqi forces are now firmly in command, manning new checkpoints on the road to the city. The city was peaceful but Kurdish areas looked like a ghost town, with shops and homes sealed shut. The thousands who fled the Iraqi advance have not rushed back. The few people we found on the streets spoke of uncertainty, and loss. Some were angry at Peshmerga fighters for not defending the city. Others blamed Massoud Barzani for triggering the Iraqi takeover with last month's independence vote. A large poster of the president has been damaged by fire. Locals told us Shia militia, officially controlled by Baghdad, set it alight when they entered the city. The burnt portrait is a potent symbol of his loss of authority here. Kirkuk is an oil-rich province and its oilfields were vital to the Kurdish economy. It lay outside the administrative boundary of the Kurdistan Region, but was claimed by both the Kurds and the central government. The province is thought to have a Kurdish majority, but its capital also has large Arab and Turkmen populations. About 61,000 people fled Kirkuk and surrounding areas after the Iraqi military operation began, the UN said, although some have since returned.